Light rain (celkem 6.0mm), mostly falling ve čtvrtek odpoledne. Very mild (max 12°C v sobotu odpoledne, min 1°C ve čtvrtek v noci). Wind will be generally light. Moderate rain (celkem 12.0mm), heaviest v úterý odpoledne. Very mild (max 13°C v neděli odpoledne, min 2°C v neděli v noci). Wind will be generally light. Tabulka výše zobrazuje předpověď počasí pro Sölden v nadmořské výšce 1370 m. Naše sofistikované modely pro předpovídaní počasí umožňují poskytovat sněhovou předpověď pro horní, prostřední a dolní stanice střediska Sölden. Pro zobrazení předpovědi počasí v jiných nadmořských výškách, použijte navigaci nad touto tabulkou. Pro rozsáhlejší informace o počasí můžete použít Meteo Mapu" lokace Austria. We have been to Solden twice now, at the end of February 2012 & 2013, and we are about to return, in 7 weeks, for our 3rd visit. We have, in the past, returned to 3 resorts more than once, so that we feel we have explored their full potential before moving on. Other resorts only once, usually because the runs were not as described (too difficult) or the lift system/piste markings were poor, or unreliable snow fall despite the hype about snow cannons (which can only be used then the temperature drops below freezing!). As we get older we have become more particular about how well the resort meets our needs and the length of time researching them, the accommodation and flights etc has become more of a chore; so we are less likely to move on than we may have been in the past. Solden was on our tick list for many years, but as it had rather a “party” town reputation we had given it a miss, until we met someone that works for a charity that organises rehabilitation holidays for injured service men and women, BLESMA. As the people in this group are all amputees, they use Snowbikes (Skibobs) which we also use due to back and knee injuries that prevent us from skiing these days. All of Austria is Skibob friendly (unlike most of France) and this resort, in particular, is good because of BLESMA returning every winter with a new group of beginners. The resort is split into two distinct areas, joined by lifts on the mountain and road/free bus in the village. The free bus that shuttles people from one end to the other gets overcrowded at peak times. You can leave your skis etc at the main ski-hire shop at either lift for a small fee; makes life so much easier! The most popular part, by far, is the Giggijoch end of the resort, where most of bars and restaurants are and a bubble lift that does have queues early in the morning due to Ski Schools and shear number of properties in the area, plus it’s a nicer part of the mountain range to start the day off in our opinion. To be honest, the queue is quite fast-moving and never took longer than 15 minutes. From day 2 onward, after the weekend, there wasn't a queue. 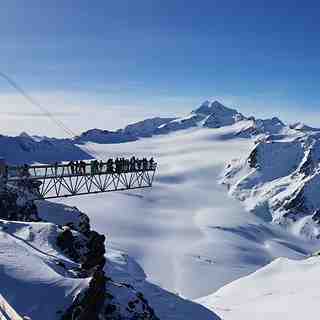 Once you get to the top of this lift the runs fan out with various options, one is to continue upwards to the Glaciers. The comments about the long length of time it takes to get to the glaciers are, in the main, due to a bottle neck, where all the people who came up from the Gaislachkogl end of the resort end up at the same point as you and there is only a chair lift to take you to the next section (rather than a cable car). But once you get through this things speed up a bit. You just have to be patient and accept that it’s a small price to pay for such wonderful views and runs when you get up there, especially the 15 km unbroken run back to the resort - that everyone can ski! The pisted range is plenty for the average skier, we have still not done all the reds, and I believe the off-piste is good too. The entire lift system is modern and efficient, map and markings are good, snow quality guaranteed. Nearly all runs are above the tree level, so exposed if the weather turns nasty but they are lovely and wide, great for cruising. If you are a timid 2nd week skier, there are lots of gentle blues, most of which are actually on the glacier which is unusual, so even beginners get to ski high-altitude runs rather than the norm where blues are often stuck at the bottom near town! One minus is that when the weather is bad and the lifts to the glaciers close, the remaining runs near the main lifts do get crowded. The glaciers areas are so extensive that it's not until they close you appreciate just how many people are on the mountains. This happened once on our holiday but we never felt that it was too crowded to ski safely; we just made for a quieter area. The food in the restaurants is typical Austrian fare, good but not cheap (this is an expensive resort due to snow-sure altitude and mainly German/Russian clientele). The standard of hotels is varied from 5 star to self-catering only, lots of B & B’s, small guest houses etc and from our experience Austria beats other European standards by a long way. The resort is buzzing at night with lots of bars/night clubs. If you want a good night’s sleep, don’t stay in a place on the main road, or at least avoid rooms at the front. It’s a busy road but there are lots of places to choose from off the road that are still near the lifts. To sum up this place from a 60 year olds’ perspective and 14 years of skiing, it ticks all the boxes. 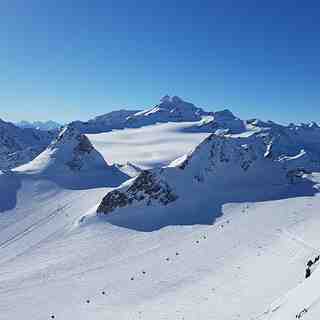 Efficient, modern lift system, guaranteed good quality snow, two glaciers, rolling wide runs with lots of blues and reds. Skibob hire centre and facilities to leave equipment at lift depot. Night life if we want it, good standard of accommodation, convenience of lifts in relation to accommodation. Shops in the town, short transfer from Innsbruck airport, not over-run by English! For now, we think it’s hard to beat, but you never know!